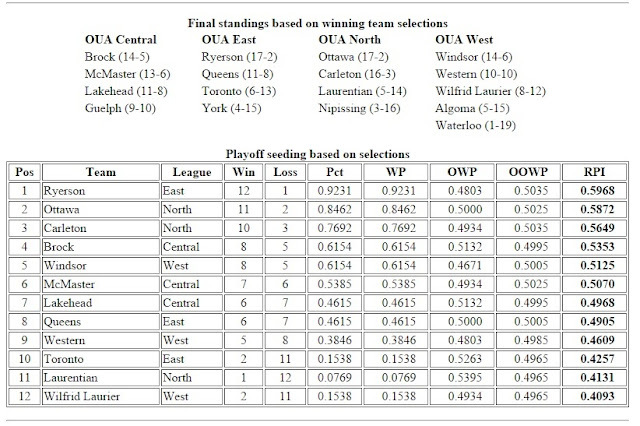 Focus up: whether it is Guelph or Lakehead as the OUA Central's third playoff team is yugggge. 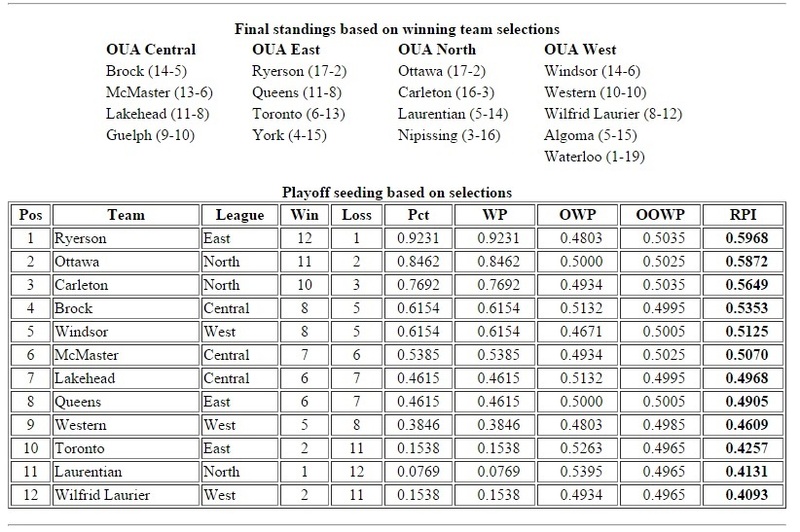 For fun, time to go to cishoops' Scenario Consideration page, playing with drop-down tabs — Laurentian over Ottawa? Why not? 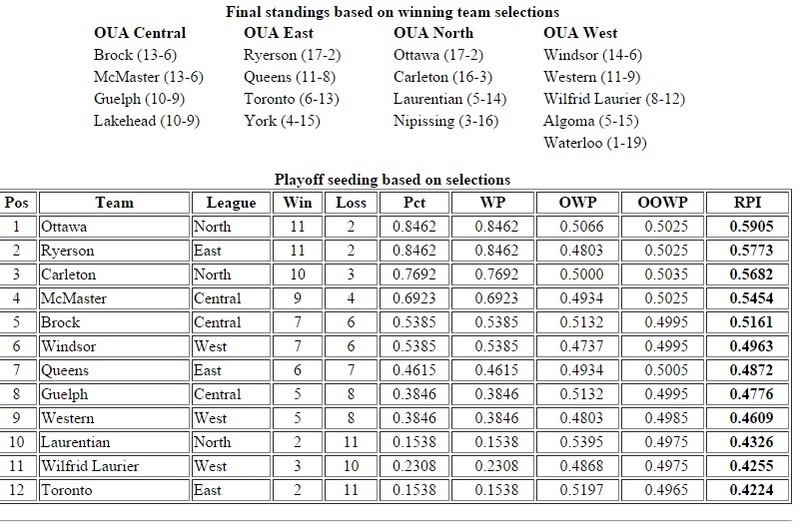 — to see how it would affect the RPI used for playoff seeding. There should be some discord if, indeed, it comes to pass that 6-13 Toronto and 5-14 Laurentian get in over 9-10 Guelph. The point of an analytics-based playoff seeding was to strip out some of the geographical biases that came up under the old East/West structure. This is the business we have chosen, though, so here's a handy bullet-pointed listed of games that could turn the table. The RPI-ifications of each game are being considered in a vacuum (i.e., the higher-percentage teams win all of the other games). Mac at Brock, 7:30 Wednesday, Meridian Centre — St. Kitt's is getting its big-venue game on, and the Badgers will have benefit of a raucous student section. 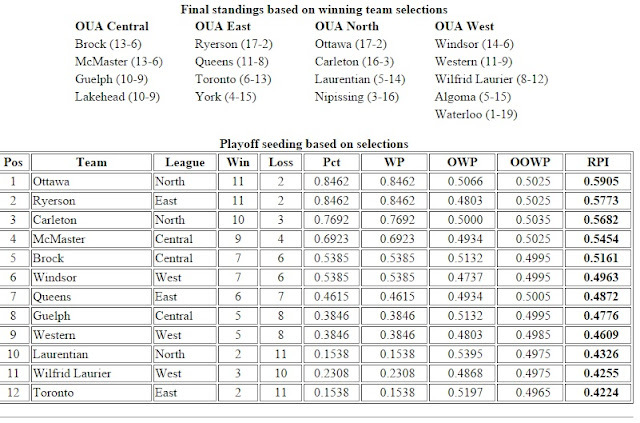 McMaster could vault to fourth in RPI with a win, with the Badgers and Windsor Lancers sliding a slot. That takes that Mac-Carleton quarter-final out of play. Ryerson at Queen's, 8 p.m. Friday — Worth noting since Sukhpreet Singh and the Gaels are one of the more intriguing mid-table teams, fomenting a certain alumnus' delusions that Queen's is the sleeping giant of OUA men's basketball. 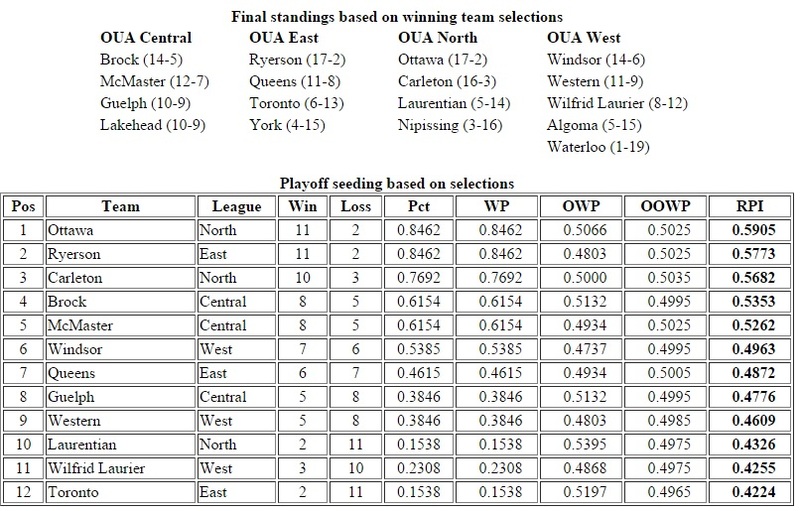 If Queen's somehow, some way turned around a 16-point losing margin from their January game at Mattamy, Ottawa would vault to first with Ryerson second, Carleton third. Lakehead at Western, 8 p.m. Friday — The Mustangs probably did the math; a home-floor win potentially creates a playoff rematch with the Thunderwolves in the 9 vs. 8 prelim game. Toronto goes to Queen's in the 10 vs. 7 in that scenario. Mac at Guelph, 8 p.m. Friday; Brock at Guelph, 8 p.m. Saturday — Whither the Gryphons after administering comeuppance to Juwon Grannum-less Ryerson? Mac handled Guelph 99-77 at home in January, shooting an effective 56.3 per cent with all five starters hooping at least nine points while Rohan Boney scored 18 in as many minutes. Now, in the possibly more plausible scenario that the Gryphons got that all-important tiebreaker-inducing win at the 11th hour against the Badgers, who will have had two full nights off? Ottawa again goes to No. 1. 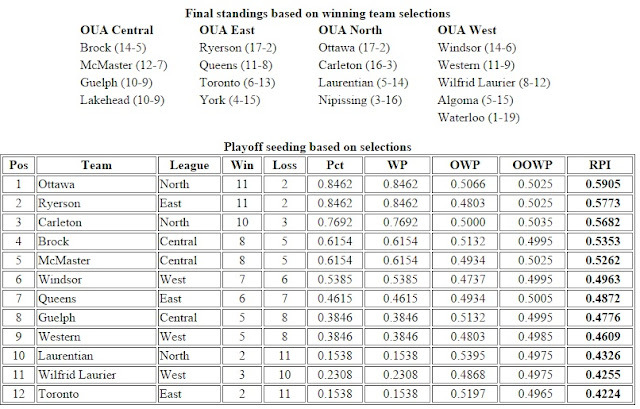 It pretty much plays out that way in any scenario where Guelph goes to the playoffs and Lakehead is eliminated.